The post Setup Your MacBook With These 4 Indispensable Mac Apps appeared first on Tekiota. The post How To Share a File in Google Drive appeared first on Tekiota. There are 3 reasons for this article. Number 1: there are no dumb questions. Number 2: you need to know this. Number 3: sharing options in Drive can be more complicated than you would expect. 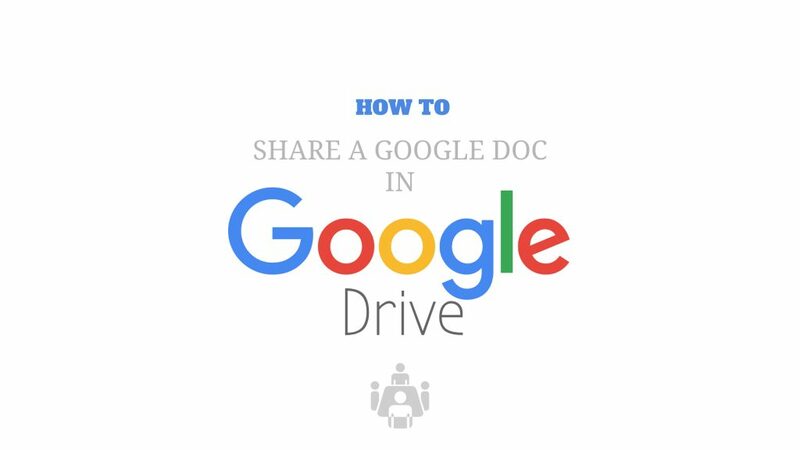 This is a tutorial so you can master how to share a file in Google Drive. Click on File > Share or click on the top right corner on the Share button. The Share With Others window will pop-up. 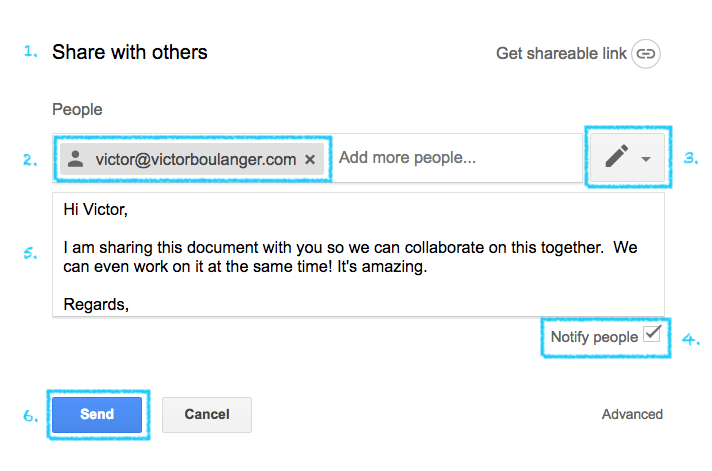 Under People, write the email address of the person you want to share this document. As the icon of a pen indicates, you will allow the other person to edit your document. You can click on the pen and switch this to view access or comment access instead (we will look at the difference in details below). Since the box in the bottom right corner is checked, you will notify the person by email. You can write a message which will be part of the email sent as a notification to the other person. That’s it, your document is shared. When you click on Advanced in the bottom right corner, you will have options to fine tune the sharing of your Google Doc. Specific people – Only the people you selected can access the document. Anyone in organization with the link – Anyone at your company who has the link to your document can access it. Anyone in organization – Anyone at your company can search for and find your document. Anyone with the link – Anyone with the link to your document can access it. Public on the web – Anyone on the Internet can potentially find your document via a search or with the link. 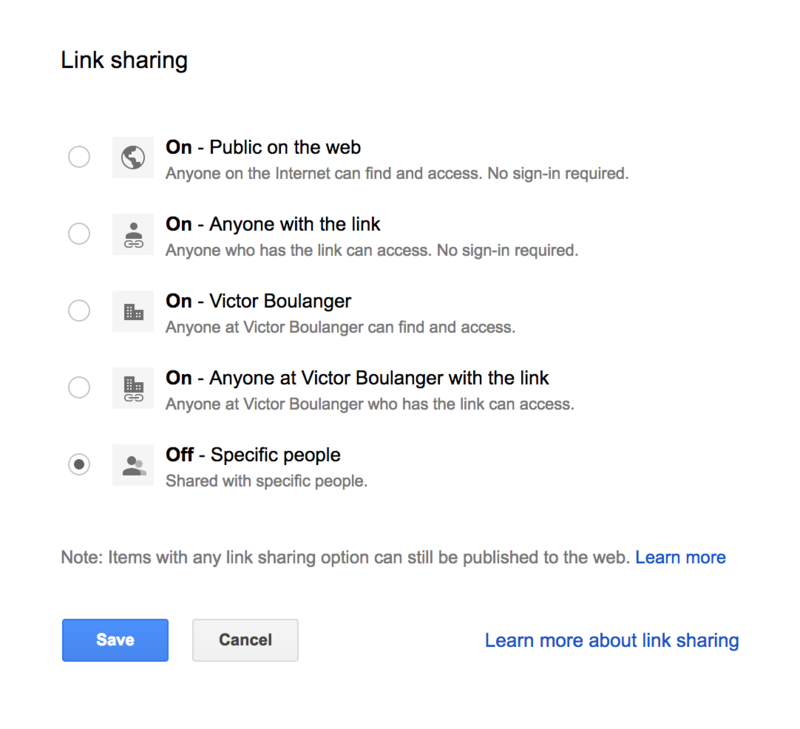 You can also learn more about link sharing from Google. If you click on Get Shareable Link, your document will be shared with anyone in your institution who has the link to your document. The link is actually automatically copied to the clipboard and you can paste it anywhere you want to distribute it to people. 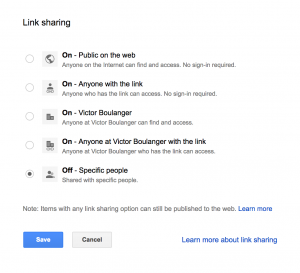 The shareable link is a fast option to share. It is available from a variety of places. It does pop up in Gmail for example, when you attach a document to an email but the recipient may not have access. You should note that this option not as private as selecting specific people with whom you will share your document. When you click on Advanced, as the owner of a file, you also have further control when you share a file over its usage. By default, when you give another user editing rights on your document, they can in turn share it with more users. Click on Prevent editors from changing access and adding new people and this option is removed. 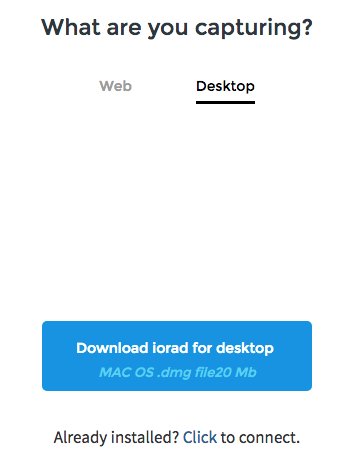 You can also share a file but disable the option to download, print or copy it. This is great if you want to make a file public online but prevent other users from re-using it. Do you have a fabulous video to share but you are concerned about posting it on YouTube for privacy issues? Ms. Pearl Ortiga has a very elegant solution for you: create your video and upload it to Google Drive. 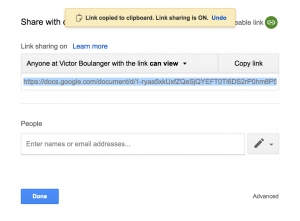 Using the Google Drive advanced sharing settings described above, set your uploaded video so that anyone with the link can view your document. Then copy and share the link with people. 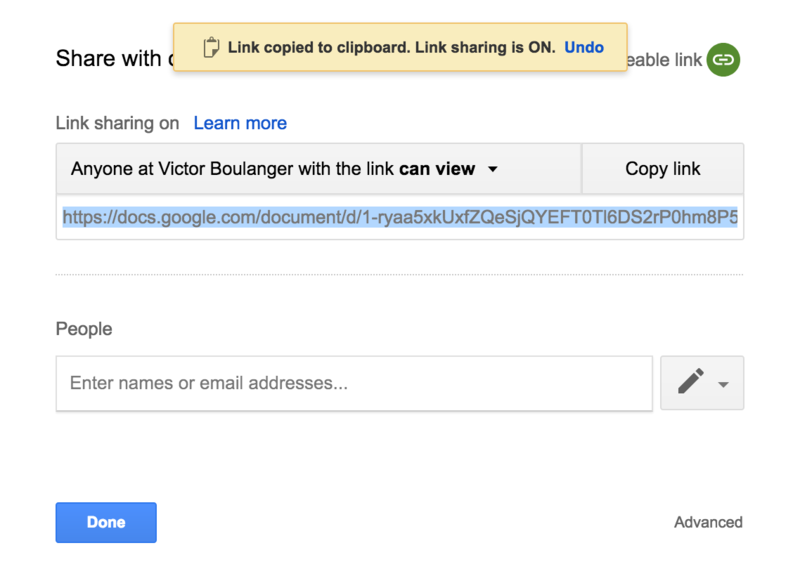 Right click on the video in Google Drive and select Share. Click on Advanced to get further sharing options. Under Owner Settings, check the box that disable the option to download for commenters and viewers. I hope this tutorial answered all the questions you had about sharing a file in Google Drive, but if you have more, please ask them in the comment section below and I will respond! The post 5 Reasons To Share Files in Google Team Drives appeared first on Tekiota. Google Drive introduced the concept of real-time collaboration on documents and developed it as a transformational tool for organizations. Team Drives is an extension of the cloud-based file system which is a very logical choice for many teams and departments. 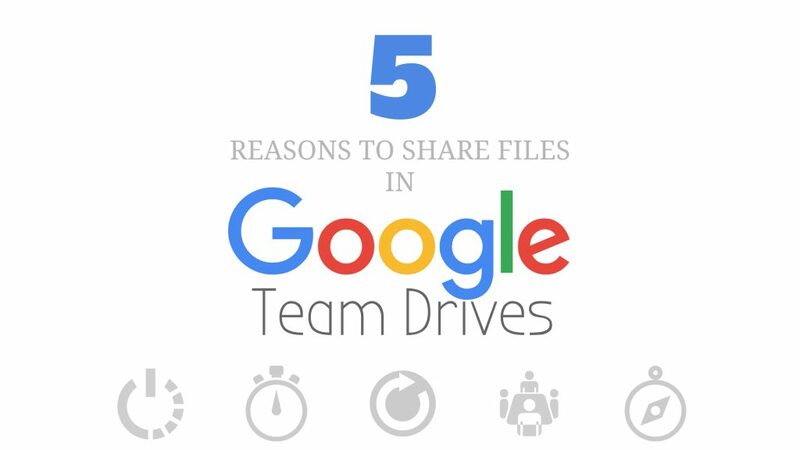 Here are the top 5 reasons why you should make the switch-over to Google Team Drives and start sharing your files as a team instead of from your own Google Drive. With Google Drive, you are able to collaborate on your documents in real-time and seamlessly with your colleagues. You started by moving your files to Google Drive. Next you created some new files directly in Drive. Then you shared certain files with some people and other files with other people. Now it’s a royal mess. To fully integrate your team’s work, you should move your shared files to a Team Drive. 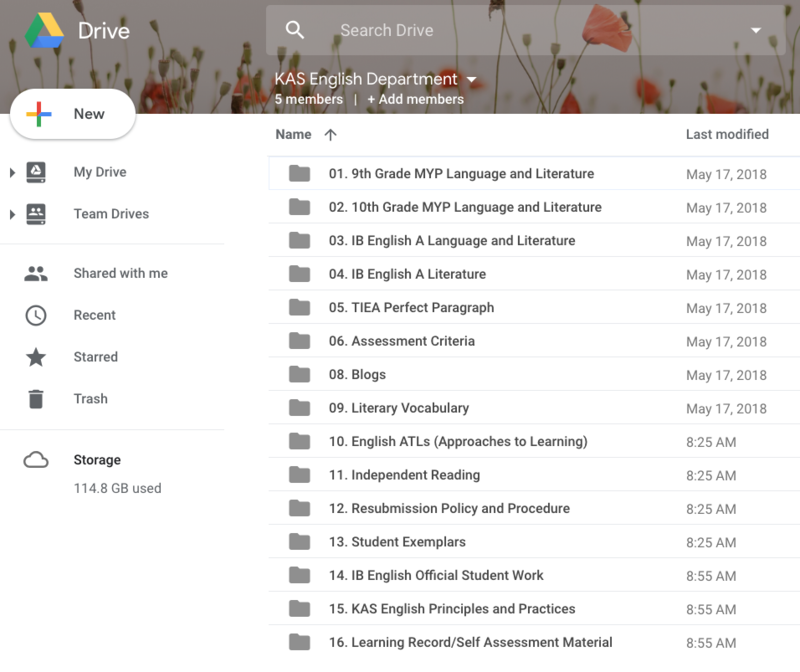 Organizing and finding shared files in Google Drive, is not just a reason to use a Team Drive, it is Google Team Drives’ raison d’être. 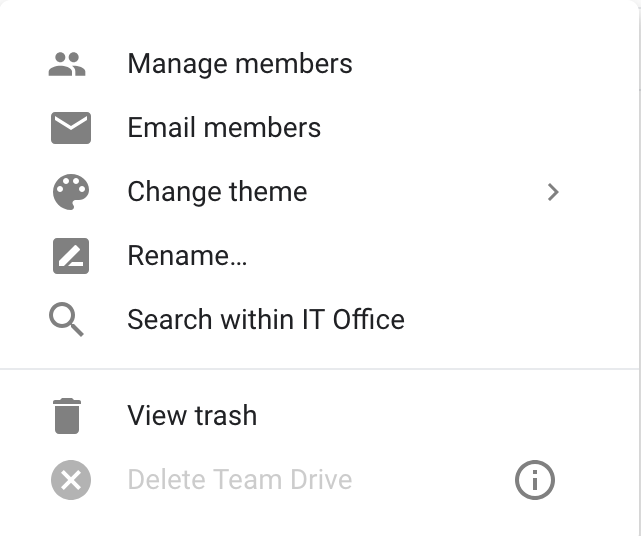 Go to Google Drive and create a new Team Drive. 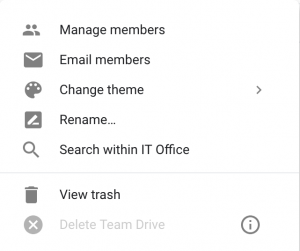 Create a new folder in Team Drive. Move the files you want to share from your Google Drive into the folder you created. The problem with this approach, is that I am fully dependent on a fresh user to take action on a step that I view as crucial (adding a folder to Google Drive), but that the user can ignore, misunderstand, reverse or all three in short succession. Before you need it, you don’t know you need it. And when you need it, you don’t know where it is. 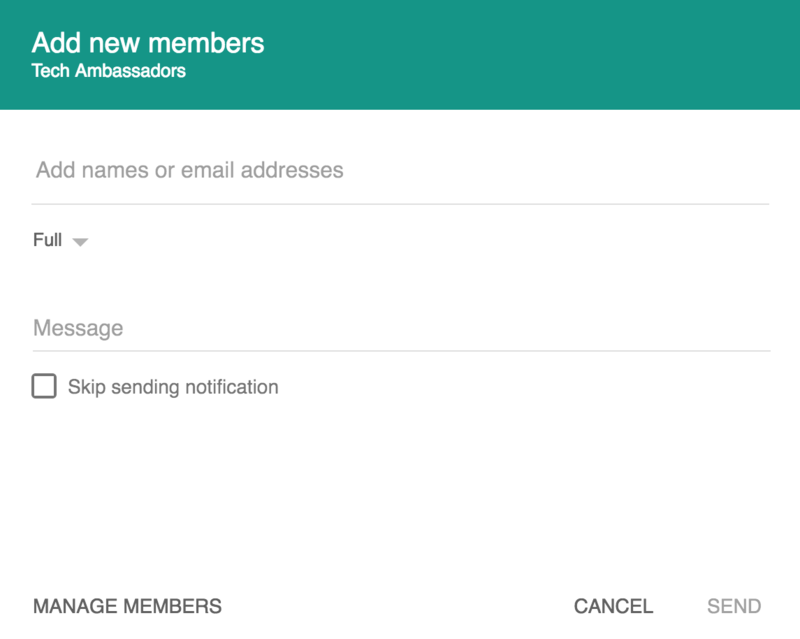 Now you can simply add a new member to your Team Drive and this member will have access to all the documents she needs. Even better, all you have to say is: “Check, it’s in your Team Drive.” Onboarding. Done. Your team is fully integrated. I hear this question a lot, especially this time of the year. The truth is that if you are not careful, you could delete years of collaborative work with a few short clicks. You are also at the mercy of your administrator to take the right steps to archive your account once it is deleted. When you move files to Team Drives, the ownership of your file is transferred from you to the team. When you leave, all the files in Team Drives remain available to your colleagues and the continuity of the team’s work is insured. Probably one of my favorite reasons is that once you migrate your collaborative work to Google Team Drives, your team members will no longer need to inform you every time they are sharing a document with you. Documents are shared by default in Team Drives. You will stop receiving invitations to view or edit documents by email. I archive all my emails, I delete all my Google Drive notifications. Team Drives makes sense. A direct consequence of the lack of notifications is that it will bring you closer to your objective for a perfect Gmail inbox. 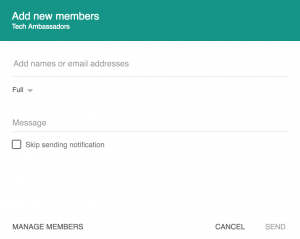 You will no longer need to keep the notifications email Google Drive sends and use your inbox as a documents holder. Emails remain in Gmail, documents stay in Team Drives. What a beautiful system. 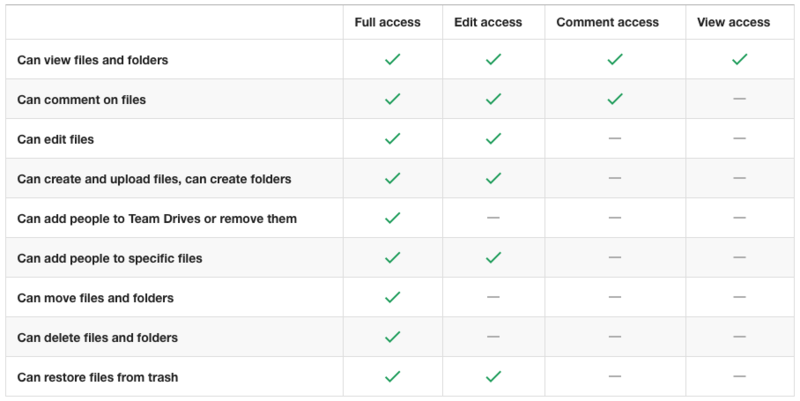 Edit access – includes view and comment access, and additionally lets you create files and folders. Full access – beyond editing access, this allows a user to delete files and add people to Team Drives. In short what you need to show about new Team Drive members is that they can be passive (view access) or active (comment access) viewers. They can create files but not delete them (edit access). Or they can control all files and users of a Team Drives (full access). The details of Team Drives permissions is listed in the following chart. Team Drives introduced a really powerful collaborative workflow to Google Drive. It quickly integrates new members to a team and safeguards stability of shared documents in a group. In order to achieve the survival of files beyond the deletion of an account, it forces users to relinquish ownership of their files to the benefit of the team. Moving files changes ownership to the Team Drive. Files are removed from My Drive when moved to a Team Drive. File permissions and links are not changed. People who are not Team Drive members can still access the files you previously shared with them. Go to the Google Admin console. Go to Users and select a specific user. On the user’s page, scroll to the bottom, click Show more and click on Admin roles and privileges. Click Create new roles and name it Ability to Move Folders To A Team Drive. On the Privileges tab, select Services > Drive and Docs, and check Move any file or folder into Team Drives box. Click Save changes. then assign this role to the user(s) who needs to migrate a folder. Are you a Google Team Drives convert? Do you have any tip or tricks for Tekiota readers? Let us know in the comment section below. You can also visit the G Suite Learning Center to learn how to use Team Drives. 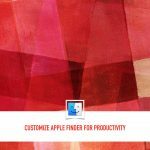 The post Customize Apple Finder To Make It Work For You appeared first on Tekiota. 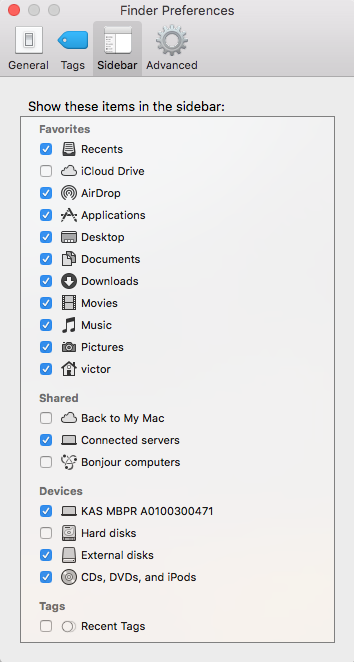 If you use an Apple computer, you are going to find yourself spending a lot of time with Finder, the macOS file explorer. Unfortunately, in its default settings, Finder tries too hard to make things simple, which induces exactly the opposite effect. 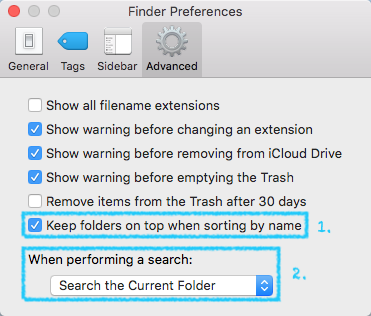 This is how I customize Apple Finder options to vastly improve my experience browsing for files on my MacBook. The first stop is in Finder Preferences. 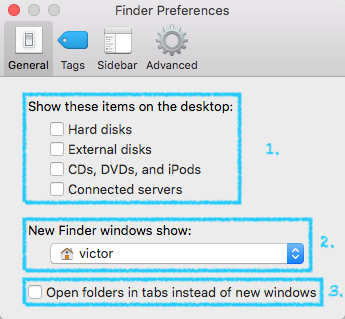 Open a new Finder window, then click on Finder > Finder Preferences in the menu bar at the top of your screen. I like to keep my Desktop clean of distractions. I also tend to always have an external hard drive connected to my laptop. For these reasons, I uncheck all the boxes to show extra items (hard and external disks, CDs, etc.) on the desktop. But most importantly, I do not want a New Finder windows to show All My Files. This is the utter chaos I try to avoid using Finder. Instead, the first thing I do before even using Finder, is to switch the New Finder windows to show my Home folder (the one with the little house icon). The Home folder is a great location which contains all the major folders I need: my Documents of course, but also the Desktop (yes indeed, that’s where your Desktop folder is located in your directory), your Movies, Music and more. Tip – As you strive to get organized, only keep folders inside your home folder, leave it clear of files. Since I find no pleasure in using tabs with Finder, I also uncheck that box. And of course I hide tags because who uses tags? Anyone? Anyone? 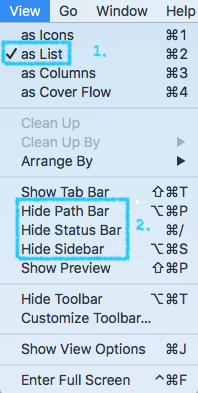 There are two options I like to modify in the Finder Preferences’ Advanced Tab. I like to keep folders on top. It makes it a lot easier to navigate directories when you can clearly separate between folders and files. I perform searches in the current folder by default. If I really can’t find what I’m looking for, I switch over to a full Mac search. There are other options I change for Finder, which you can find in the View dropdown menu off the Finder menu bar. I display items as List (command + 2). This is important as we change the View Options later on. I show the Path Bar and the Status Bar (both at the bottom of the window), and the default Sidebar. I hide the Tab Bar and the Preview. Next I navigate to the home folder, then go back to the View menu and click on Show View Options. I always open and browse files in list view (see how I display items as List above). I do not arrange them, but I sort the files by Name in alphabetical order. This is a great trick that will help you understand how you are using storage space on your hard drive. Did you ever fill up your computer and try to figure out where the bloat was? The storage windows which you can find under About This Mac is good idea but in practice it is useless. By selecting the option to calculate all sizes, you will see on each folder a summary of the number of gigabytes used. Since we selected to start new Finder windows in your home folder, you will instantly see where all the data is. I told you. It’s magical. Finally, and very importantly, I click on Use as Defaults so this can apply to all the folders I will open from this point forward. 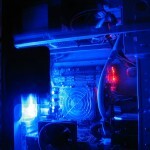 I go in depth about Finder because it is the tool that lets you organize your computer. If instead you want to launch a program, fire up Spotlight. Spotlight’s keyboard shortcut is command + space and you’ll never need the dock again. Spotlight is also very good at finding your long lost file. 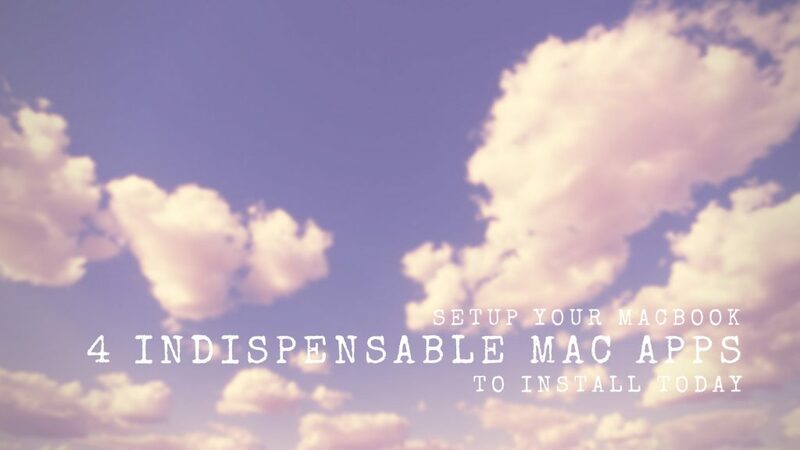 If setting up your Mac Finder has you invigorated, you might want to check out our Apple maintenance tips to do a whole spring clean-up. Did you learn something new here? Do you have any other trick for your Mac? Let us know in a quick comment below. The post Make A Video Slideshow With Your Photos in Minutes appeared first on Tekiota. Whether at home or at work, I often have to quickly turn a bunch of photos into a video slideshow. Over the years, I have tried many different apps until I found the absolute best one. Now I create these videos and share them in no time, but if you don’t know what you are doing, it could take you ages. Let me show you how to make a photo slideshow and create a movie in minutes. Combining all your photos into a short movie shouldn’t take hours, and yet if you do not use the right tool, you may be in for a rather unpleasant surprise. In fact, I do not use the usual video editing tools like Adobe Premiere or Final Cut Pro to create my photo slideshows. Even dedicated slideshow apps can produce results with a distinct 20th century look. There are video editing apps that provide slightly faster workflows. iMovie does a decent job. It’s easy to import the photos and quickly add them to the timeline. But I find that the final layout of the photos is rather boring. 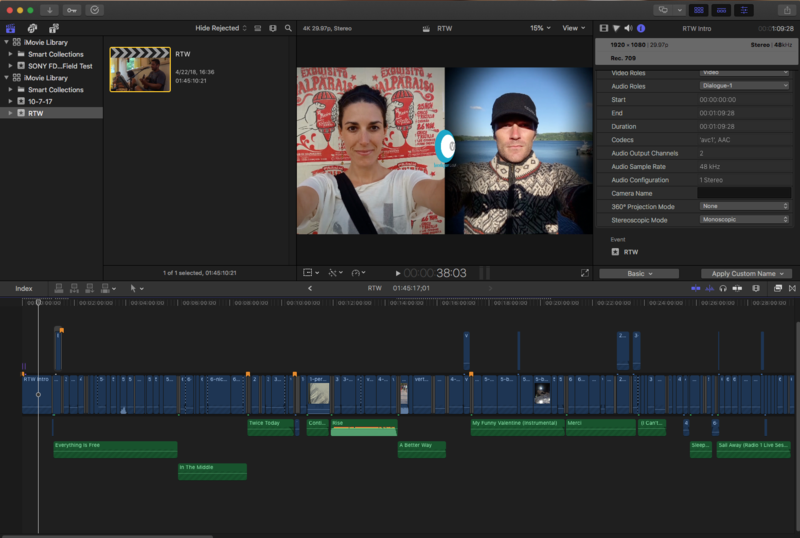 Magix Movie Edit Pro can handle the task, but the results are also slightly underwhelming. Dedicated slideshow apps unfortunately do not fare much better. Magix’s companion app is specially built to make videos out of photos. Yet most of Magix Photostory Deluxe‘s templates create slideshows with a distinct 20th century look. Nevertheless on a Windows machine it might be your best bet. This is why my goto app for slideshows is not a video editing software, but the Apple Photos app. It’s worth noting that I do not use it to handle my photos. In my opinion it does a horrible job of that. But when it comes to creating a beautiful slideshow, it is simply the best out there. 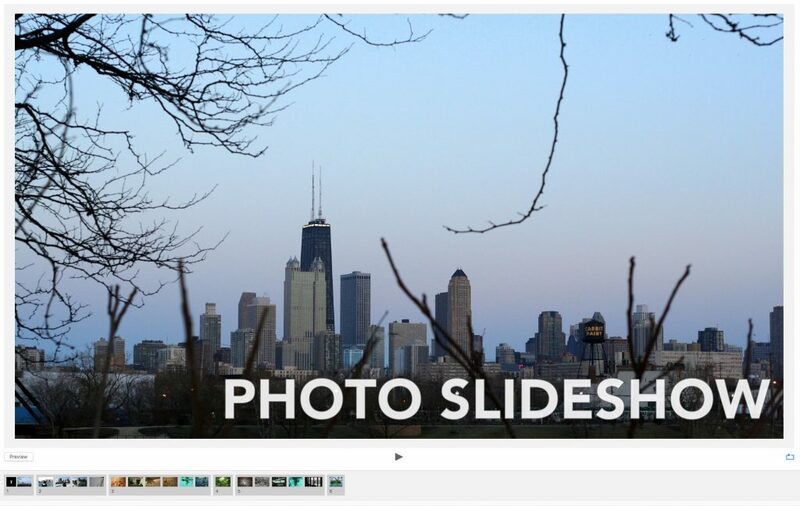 Here are the four simple steps required to make a slideshow in Photos. 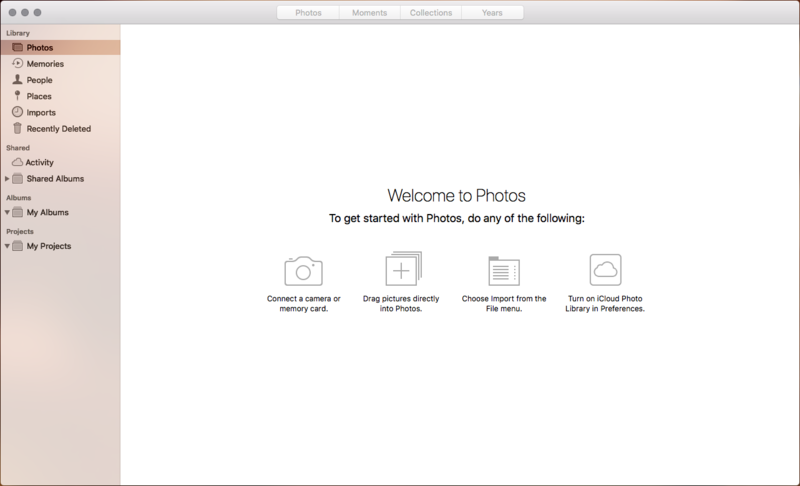 After you launch the Photos app on your Mac (sorry, this is only available in the Apple ecosystem, on other platforms you might want to look at one of the solutions suggested above) you will need to import your photos by click on File > Import. Then go to the Photos tab in the Library and select all the photos you just imported. Note: Photos organizes your pictures in chronological order, so in case your photos are not all neatly found in succession in the app, you can locate them in the sidebar at the Library > Imports tab. Next, with all your photos selected, click on File > Create Slideshow. The Classic style which is the default one selected for your slideshow is very basic. It gets a lot more exciting once you change it by clicking on the Themes icon ( ) in the right sidebar. No offense to Ken Burns, my favorite themes are Origami, Sliding Panels and Magazine. Each of these produces a really cool montage of your photos by alternating full screen slides with only photo and collage of multiple images. Once you’ve previewed your work and are happy with the results, you are ready to turn your slideshow into a video by clicking Export. Pick high definition ( HD 1080p) and save the video on your computer. In a few minutes you will have a beautiful video ready to be shared with everyone. 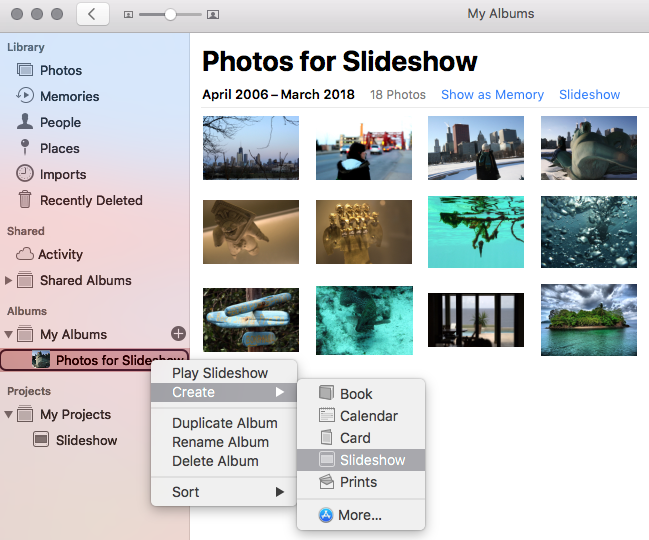 A very cool feature which my friend Margo Carnahan and I discovered is how to keep your photos in order when you create a slideshow on your Mac. In the Photos app, you should first create an album with your photos. Select your photos and click on File > New Album With Selected Photos. Next you can organize your photos in the order you choose. Finally and this is the most important step, instead of clicking on File > Slideshow as we mentioned above, you need to go to Albums in the left sidebar, right click on the name of the album and select Create > Slideshow. It’s a bit strange, but this is the only way to keep your photos synced to your preference! Another way to obtain incredible results is to mix video clips into your photo slideshow. This is something the Photos app handles very well. You can very easily create a presentation which combines images and video clips. Select pics and vids, click on create slideshow and voila! the software takes care of the rest. Also worth noting, if you add very wide photos like panoramas, the slideshow will pan across the entire photo. It’s magical. I hope with this article you will find yourself on your way to making and sharing photos slideshows. Did you already make one? Do you use a different app to make videos with your photos? Share this with us in a comment below. 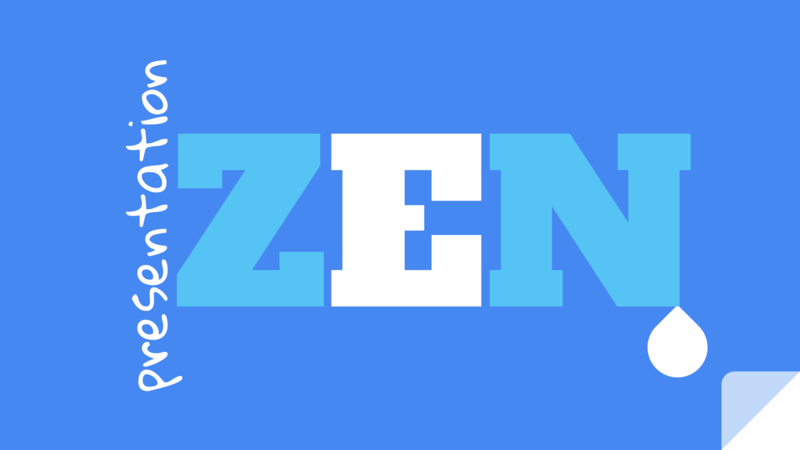 The post Presentation Zen: 6 Steps to Design Great Slideshows appeared first on Tekiota. 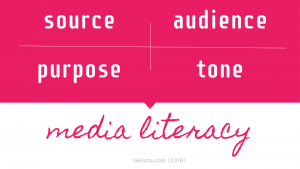 the presenter as a storyteller. Keeping these ideas at the forefront, we will look at how to successfully utilize design to become a better, more empathetic storyteller. By the way, these tips about design will work whether you use Google Slides, Microsoft PowerPoint or Apple Keynote to create your next slideshow so let’s dive right into it. I am constantly aware that success as a presenter depends on enthusiasm for the content and ability to engage an audience. And while I still hold the opinion that other teachers are the most difficult audience for a teacher to present to (because you know, they know everything! ), students who have been sitting through six other classes all day long finish a close second. At the end of the day, you probably already possess the ability to tell a good story and empathize with your audience. Good design will help you amplify your message. Presentation Zen walks you through the six steps towards good design. Avoid busy or complicated slides. If the design on your slide is too busy, your audience will tune you out while they try to decipher the information you are presenting on the screen. 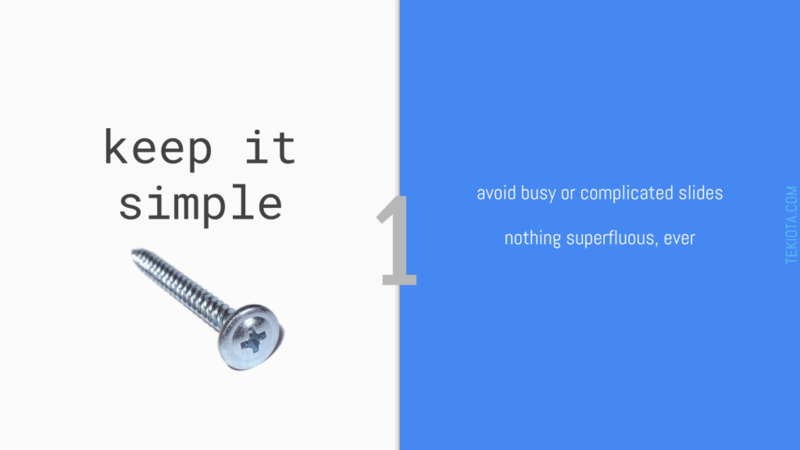 Remove everything superfluous on your slide and only communicate your idea in the shortest amount of words possible. One if you can. 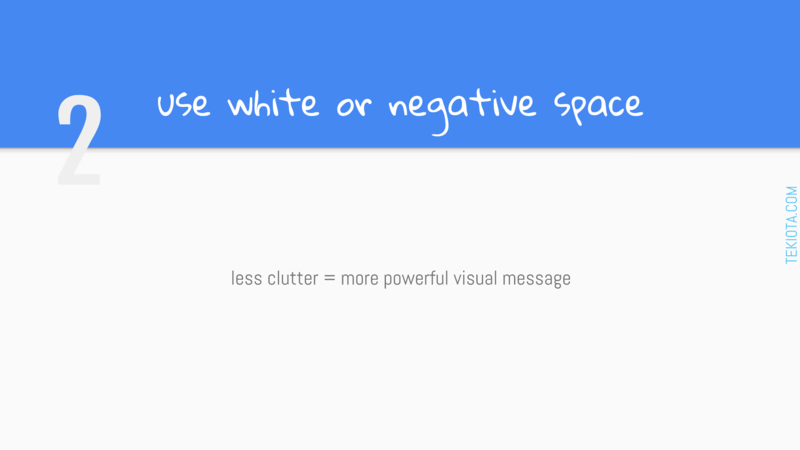 When you remove the clutter, you will offer a much more powerful, much more memorable visual message to your viewers. Don’t try to fill your slide, use white to build space in your presentation. This will make the content easy to grasp, and your speech will remain the most important thread that your audience will follow. 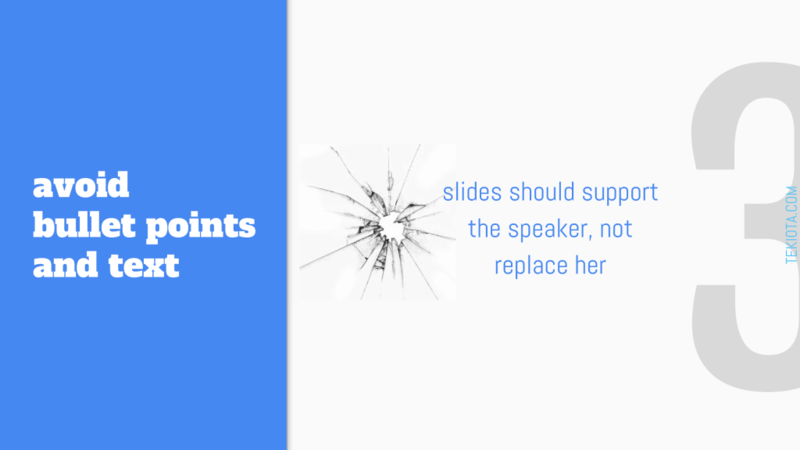 Just because PowerPoint gives you bullets, doesn’t mean you should use it for everything. Think of your presentation as a support to your speech, not the other way around. In fact, if you have three points to make, use three slides, and move through them faster. You want a direct link into your audience’s brain? 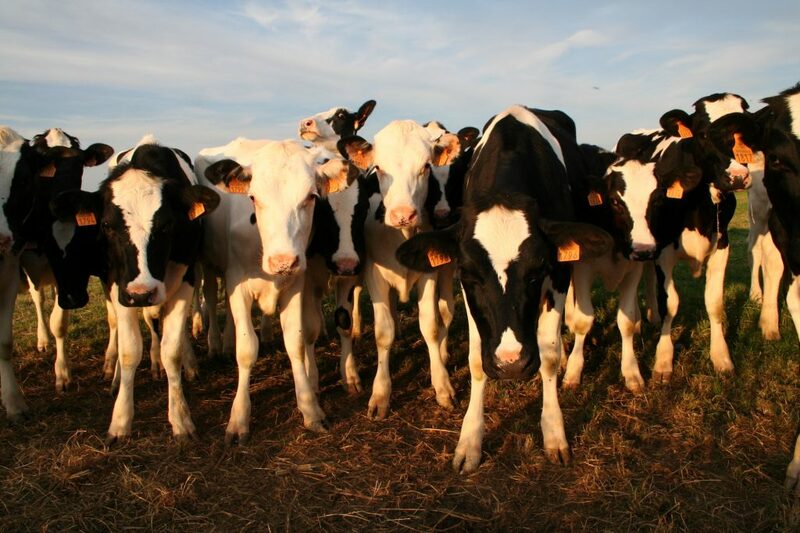 Tap into their primary visual cortex with high quality images. If you have to remember one rule from this entire article, it’s this one: use good photos. No stretch marks, no pixel blurs, no watermarks, no clip arts, high resolution photos. They are everywhere. Because nothing screams of 1982 louder than a good clip art. 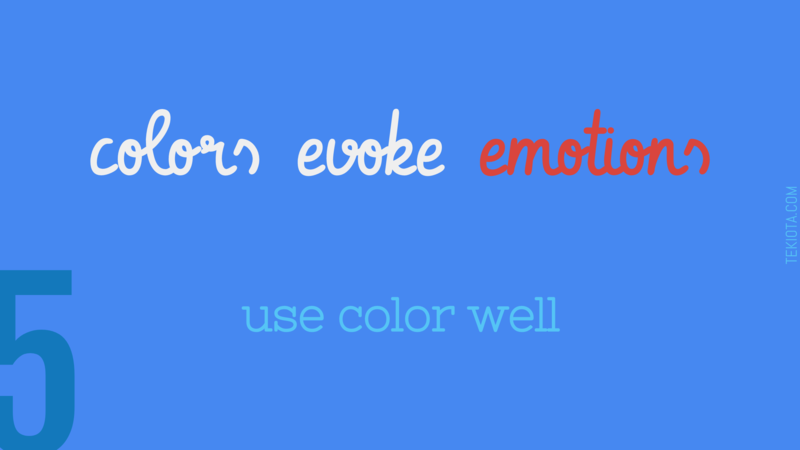 Colors evoke emotions, use them. When you begin your presentation, pick a color scheme with two colors: your basic color and a highlight color. Use not only black, and white but also a variety of gray shades to prioritize the content in your slideshow. Finally pay particular attention to the font you choose. Follow these 6 rules and you are sure to wow your audience (or at least keep them partially awake) with your next presentation. This is my own presentation zen on presentation zen. It includes all the graphics from this article. But many years later, I still come back to Thirst at one of the better design presentations of all time. Enjoy this masterful example of a presentation zen, and share with me with your best slideshows in the comment section below! 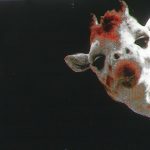 Do you talk too much? Do you talk enough? 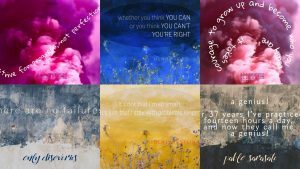 How could you replace text with more effective images? How might the aesthetics of the presentation affected the retention of its content? I already gave this presentation a few months ago. Do I still remember any of it? How will the audience get the definitions of important terms in the presentation if they are not written on the slides? Can English Language Learners who don’t have fully developed listening skills understand the presentation? Presentation Zen is an expression originally coined by Garr Reynolds. Jessica Faivre’s reflection on Empathy, Storytelling and Design is the entire inspiration behind this post. I borrowed all my wife’s ideas to write this article. The post Salvage Your Privacy While Online appeared first on Tekiota. Another day, another astonishing assault on people’s privacy. This time the proportions in the Cambridge Analytica scandal are properly epic. The company built 230 million psychological and political profiles using data harvested from Facebook without users’ consent. These profiles were allegedly used in manipulative social media campaigns during the referendum on Brexit and the last US presidential election. 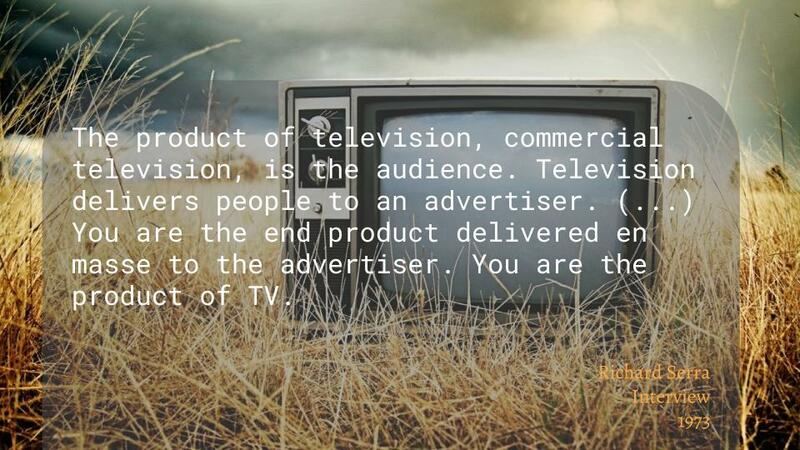 The old adage: “if you are not paying for it, you are the product”, has never rung more true. Is it time to give up your privacy rights entirely? I certainly do not hope so. In fact with this article, I want to show you ways to salvage some of your privacy while online. One of your main points of entrance on the Internet is your browser. As slick and fast as its browser is, Google makes no claim about protecting the privacy of its Chrome users. Mozilla is a not-for-profit corporation with a laudable mission. Mozilla’s mission is to ensure the Internet is a global public resource, open and accessible to all. An Internet that truly puts people first, where individuals can shape their own experience and are empowered, safe and independent. You can read the Mozilla Manifesto to learn more about the values driving this community. In it, you will find principle number 04 about security and privacy. Mozilla’s web browser: Firefox is in service of Mozilla’s mission. I find its latest version, nicknamed Quantum, to be extremely nimble and readily believe Mozilla’s claim that its lighter and faster than Chrome on your computer. In fact I would argue that once a browser is launched, it should disappear in the background to let you focus on the websites you are browsing. This is exactly what Firefox does for me. I have recently switched over (or to be perfectly exact, I switched back since Firefox used to be my default browser a few years back) and I have been very satisfied with the experience. As soon as you install Firefox, go through its Settings (aka Preferences in Firefox lingo) and head to the Privacy & Security tab where you should enable Tracking Protection and send a Do Not Send signal. This is not to say that I only use Firefox’s privacy protections. I typically customize my browsers with a few additional programs known-as add-ons or extensions. There are two extensions that I install right-away to block online trackers: Disconnect and uBlock origin. Technology has evolved beyond cookies and it is becoming harder and harder to not be tracked while online. First let me explain briefly how online trackers work. Perhaps you are already familiar with cookies. A cookie is small piece of information saved by your browser when you visit a website so it can remember you in a future visit. This may enhance your browsing experience by not asking you not to login every time you come to a webpage. Unfortunately it can also allow the site or third-parties affiliated to the site like advertisers to track you and deliver ads targeted to you. With an ubiquitous presence online, advertisers can then follow you while you are browsing the Internet and establish a rather precise profile based on your habits. Technology has evolved beyond cookies. Flash an HTML5 cookies are more common now and also harder to remove. Additionally, the technique of device fingerprinting functions without the need for any cookies. It creates a unique identifier based on your browser’s configuration and settings. This also can be applied to track your smartphone, tablets or computers. If you want to see online trackers in action, this amazing tool from the Electronic Frontier Foundation will test your browser to determine whether it is safe against tracking: Panopticlick. The two extensions that I recommend, Disconnect and uBlock Origin are good first ramparts against tracking. They both block a majority of trackers and allow to clear out 4 of the 5 tests from the EFF’s Panopticlick. I install them alongside AdBlock Plus which I wrote about previously as a way to protect your privacy and AdBlock for YouTube which enhances your viewing experience on YouTube. If you want to learn more and protect yourself, the Federal Trade Commission has a very detailed page about online tracking that I recommend you read. This small humorous exchange brings to light the amount of information we voluntarily divulge to our search engines. In fact, I should probably use the singular here and say search engine, or call it by its name. With 74% of search market shares, Google Search knows almost everyone and can even use its knowledge to predict flu and dengue trends. If you are still reading this article, you are probably ready to jump off the Google ship and wear some sunglasses while searching online. But can you really do without Google? If the answer to this question is a resounding yes, you could give Qwant a shot. Dubbed the search engine that respects your privacy, Qwant does not collect data about its users when they search. The unique design of this French enterprise additionally offers a welcome alternative to traditional search engines results. What if you are not quite ready to give up the familiar feel of a Google Search? My friend Pete Rock was the first to recommend Duck Duck Go. 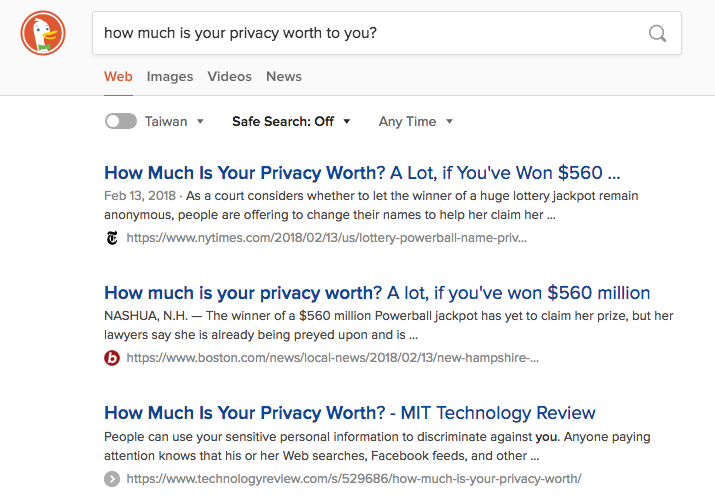 A strong advocate of privacy, Pete highlighted to me the ease with which one can transition to Duck Duck Go; switch the default search engine in your browser and voila! It took me some time, but I make most of my searches in Duck Duck Go now and it definitely feels like a safer place. Internet started from a place of anonymity where no one knew you were a dog while chatting in IRC channels. It has now converged to a point where your identity is given away by your every movement: IP address, geolocation, shopping habits, email address, avatars, monickers, etc. A bleak future might be staring us in the eye, that of a dystopian world where citizens are categorized between good and bad elements of society based on a predictive analysis. But before a data-focused social credit system is upon us, take a few tips from this page and salvage your privacy while online! Do you have more tips? Let us know in the comment section below! The post Learn Project Management Fundamentals to Get Things Done Well appeared first on Tekiota. Project management is a step by step method used in business to get things done and realize projects successfully. Anyone can apply this technique to reach goals and work more effectively. 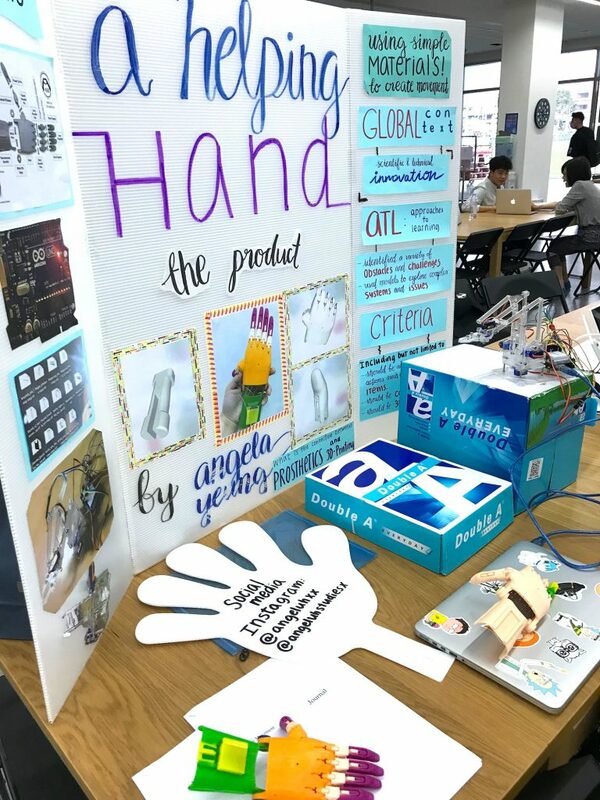 In the classroom, you can teach the fundamentals of project management to your students to guide them with the small or larger projects you assign. A word of warning if you are a project management purist. This is not meant as a summary of a specific methodology although there are many PMBOK, PRINCE2, COBIT, Agile… Instead the purpose of this overview is to distill the essence of project management with the hope that these steps will prepare anyone, including faculty and students to start, lead and accomplish future projects in a satisfactory manner. 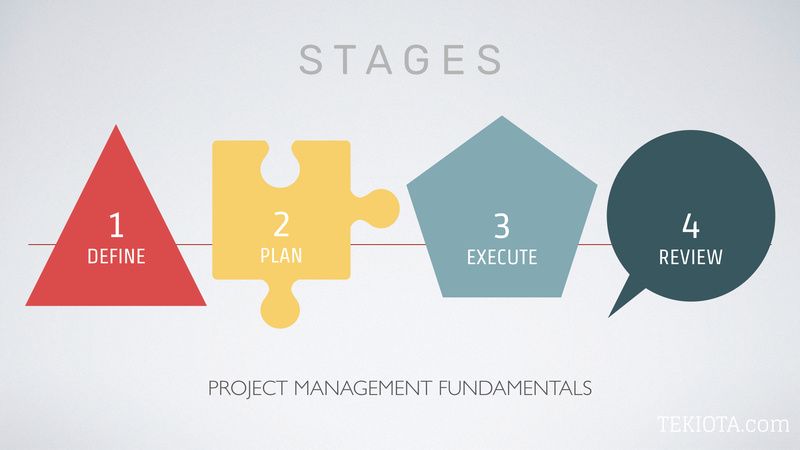 Let’s look at each project management stage in detail. What is the problem to solve? A project needs a beginning and ideally, but sometimes not obviously this is where you begin. The most important question you should ask at this stage is “What is the problem to solve?“. How you phrase this question will define the boundaries of your project. 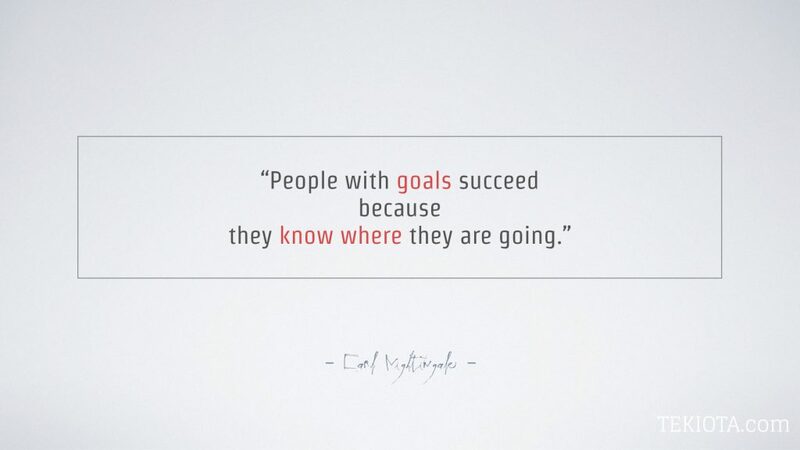 How you answer this question will define the goals you are trying to achieve. In the classroom, the teacher will often but not always provide the problem and the goals to reach to answer that problem. What will be a successful end product? This is the million dollar question: “how will you do it?” and the one that you should spend the most time pondering. The short answer is known: break your project down into small, tangible, measurable tasks. What these tasks are will vary greatly based on the project. There are a few key ideas to keep in mind when listing those tasks (and you should list them). First, it is very important to realize that the way you break down and define a task will greatly affect your success rate. If you leave a task too general (e.g. : write paper), you are much likely to complete it properly or on time. The best tasks are defined so they are SMART: specific, measurable, achievable, relevant and time-based. Second, you should estimate the time and resources needed for each task. Establish a schedule of what needs to be done, and when you will do it. Third, understand that the process is not necessarily linear. Students tend to stall when an expected milestone is not met. But you do not always have to wait for one specific task to be completed in order to begin working on another. Working on parallel to-dos can be a lot more productive (and fun). Of this requires you to be organized. Fourth, identify the risks, what could likely go wrong and prevent these events from happening. This is do time. In case you’ve skipped reading everything up until this point and you are randomly landing here, the most important thing to know about the execute stage is: this is NOT where you start. And yet surprisingly this is exactly where most people, including 99% of our students begin. Before you execute, you must spend time defining and planning (see step 2.) to get things done well during this stage. Is the project going according to plan? Do I need to make any changes to the plan? What do I have to do next for this project? What have I learned from doing this project? The results of the projects are submitted. The lessons learned during the process are reviewed. This approach is not a one-size fits all solution. Instead you should be prepared to customize these steps depending on the type of project you are facing. Providing desirable flexibility, the Agile project management methodology has gained a lot of traction as a useful framework to facilitate the execution of a project. How will you respond to change? By prioritizing your response to change over sticking to your original plan, you will be able to avoid dead-ends. Can you produce a working prototype early on? Agile also focuses on people and communication instead of the processes and tools. This too ensures greater adaptation for your project. Ideally, your conversation should revolve around a draft of prototype of your final product. You should prepare yourself for multiple iterations as feedback you gather allow you to improve over time. The project management framework has made its mark as an efficient tool in real-life situations. This overview will have hopefully introduced you to its concepts and allow you to establish a sane base with your students at the start of their next assignments. Before you launch your students into a project, do you give them the proper tools to succeed? Please share your feedback with us by writing a comment below! The post Design Training Material Efficiently appeared first on Tekiota. Writing training material is an interesting psychological experiment. I find that no matter how much time and details I try to add to a set of instructions, there will always be some room for interpretation. Someone will invariably require some level of clarification and in a classroom setting, questions will abound. Step-by-step can be quick to write but long to explain. Training videos will walk users through every single click but they are typically long to produce. There is a soft spot between these two methods: providing written instructions with screenshots of the essential steps. Natalie Rector discovered and shared with the Tech Ambassadors a fabulous new tool to design training material efficiently: iorad. Click “Save as PDF” on the next screen.&nbsp;<br><br>That’s it. You’re done. This interactive view will take you through the steps in a very realistic way, as if you were actually doing them. 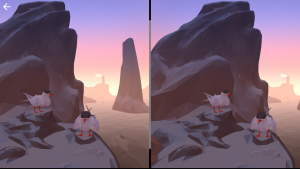 In this view, each step step will be represented by one large screenshot. To move to the next step, you will be able to click on the highlighted element on the screenshot. The full written instructions for each step are indicated in the left sidebar. The step by step view is a more traditional way to look at the instructions where the screenshot of each action is a little smaller, allowing the user to see multiple steps on the screen. These two views give your user the freedom to determine which view suits them best: a fail-free one step at a time or a more global view of the multiple stages of the process. The interface features a bottom navigation bar with options to skip forward or backward in the tutorial, share it and embed it (like Natalie’s tutorial above) and return to the main menu. The beauty of a iorad’s approach to design training material is contained in this one sentence at the bottom of the screen. 3 minutes to create a 10-step tutorial with all the screenshots highlighted is phenomenally quick! If you are curious to see how iorad accomplishes this, read on through. 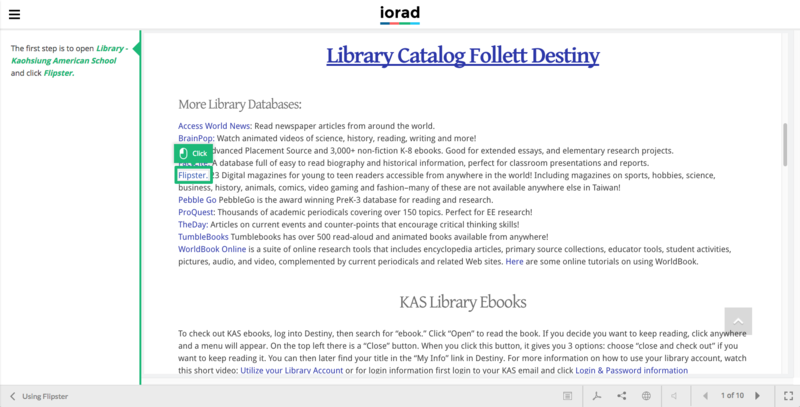 Have you used iorad? What do you think of it? How else do you write instructions? Share your best ideas with us by leaving a comment below! The post Highlight and Annotate PDF Documents appeared first on Tekiota. Love them or hate them, PDF files are here to stay. And if they look very good and are easy to open, they are almost impossible to edit. Almost but not entirely. 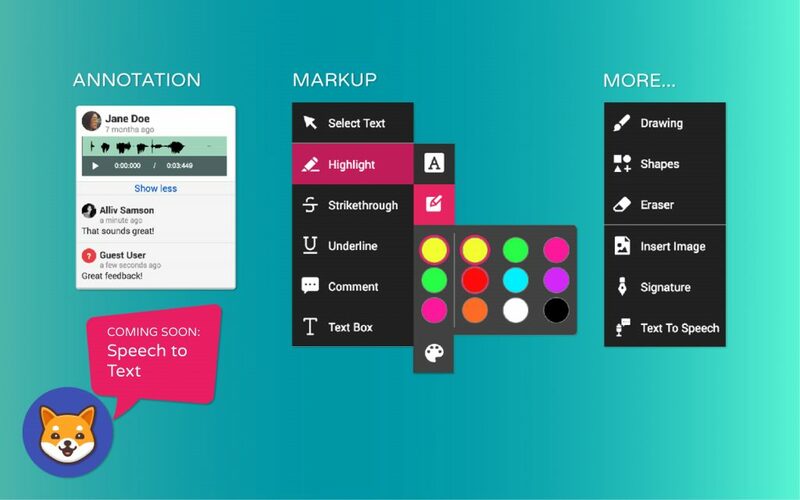 This is your solution to highlight and annotate PDF documents. PDF stands for Portable Document Format. It is a type of file much like DOCX (Word documents) or JPEG (images). PDFs were invented by Adobe in 1991 to exchange documents easily. Today, they are the most common filetype to share documents on the Internet. The reason for this success is simple: a PDF file is platform independent, it will look the same whether you open it on a Mac, Linux or Windows computer or even on your phone or tablet. Images and titles will remain in their original place. 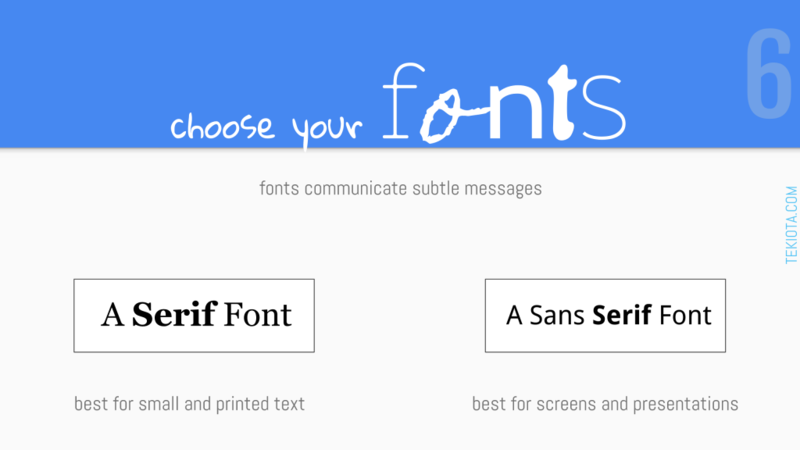 Text colors and sizes will be consistent. Even the fonts will be preserved. This makes it a great publishing format. From this major advantage comes its biggest drawback. Since it is essentially an electronic printout of a document, it is almost impossible to modify a PDF file. If you receive a Word document, you can very easily to open and add text or pictures. When you open a PDF file with most applications, you are basically limited to viewing or printing it. The smallest typo may require you to re-create the PDF file. One obvious solution to edit a PDF file, is to turn back to its creator: Adobe. In fact, the software company has an app called Acrobat Pro. Acrobat Pro is Acrobat Reader’s big brother. Where Reader has a limited set of features, the Pro version has full editing function. Unfortunately, weighting at 4.5 GB, Acrobat Pro is a humongous piece of software which comes with a hefty price tag: $180 a year with Adobe’s new subscription model. 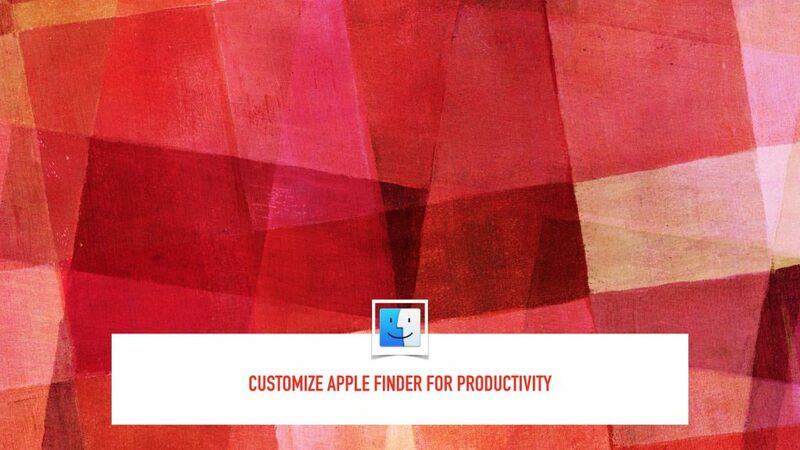 This is why the Acrobat suite is a difficult one to recommend. Instead, Terea Marcum clued us in on Kami, a new PDF app which she uses daily. In her words: “we are virtually paperless and textbook free”. Kami features a comprehensive set of tools to highlight and annotate PDF files. But her favorite feature, is the ability to collaborate. Students are able to work on the same document together to complete annotation. In the following image, you will see an example of work edited with Kami. 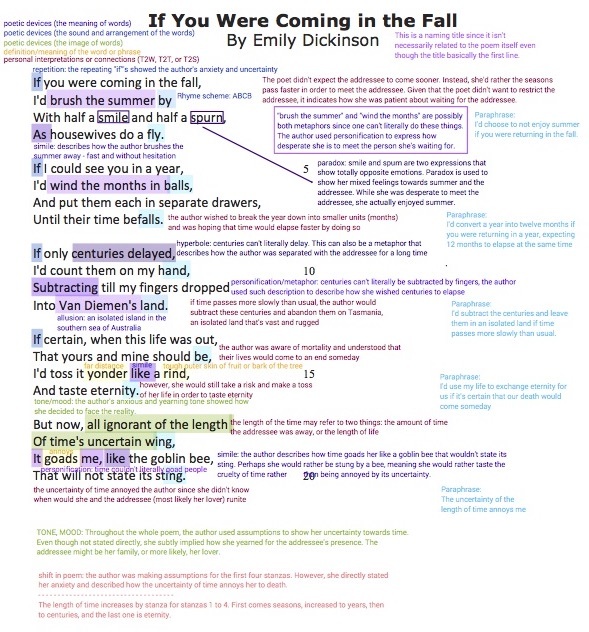 The poem is annotated according to a rubric provided by Terea. Terea is not just a fan of Kami. 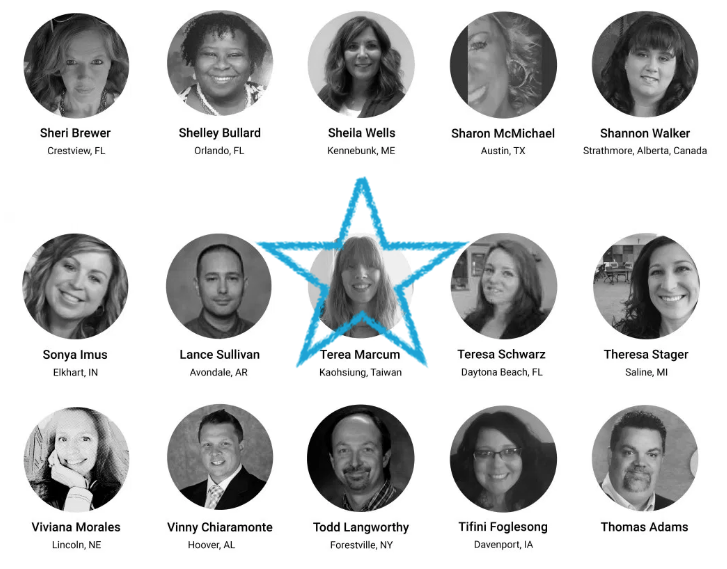 As a power user, she was recognized by the company as a Kami Hero. You can find out more about her experience with Kami by reading the article she wrote on Ms. Marcum’s Mission. Are you a Kami convert or do you use other ways to annotate PDF documents? Let us know in writing below! The post 10 Best Tech Videos for 2018 appeared first on Tekiota. 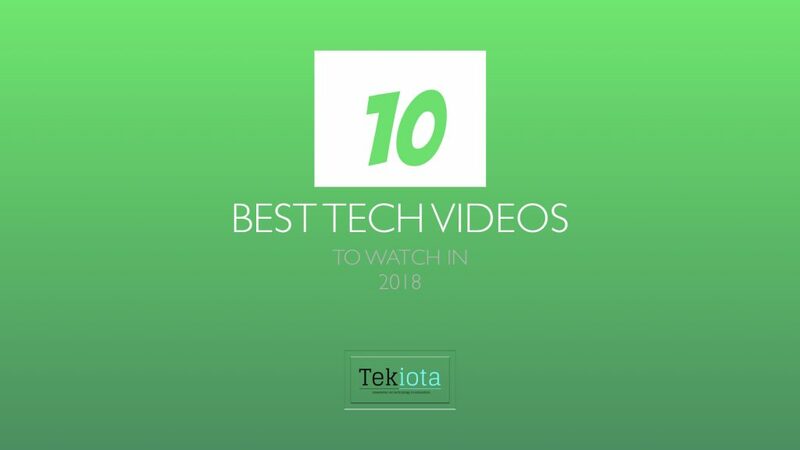 Let’s continue our best of reviews with the 10 best tech videos for 2018. Every since I saw this video, I became addicted to their Twitter channel. Visit the How Things Work page on Twitter and follow them for more awesome visual explanations about absolutely everything. With more than half of the world population living in cities, one thing is undeniable: we are an urban species. Part game, part urban planning sketching tool, “Cities: Skylines” encourages people to use their creativity and self-expression to rethink the cities of tomorrow. Watch designer Karoliina Korppoo explain How a Video Game Might Help Us Build Better Cities on Ted. Sound design is built on deception. When you watch a movie or TV show, nearly all of the sounds you hear are fake. Dive into the world of foley with an expert. More deception from Hollywood, this one a lot more chilling. 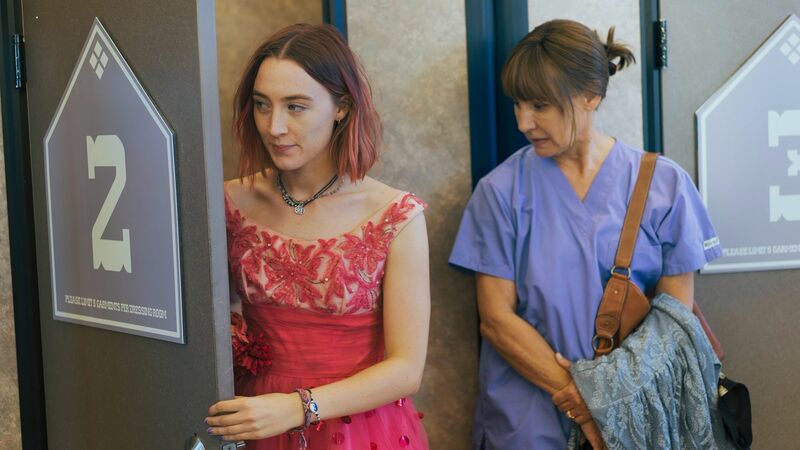 Have you watched any Hollywood movie recently? So did 95% of the rest of the world. Watch and learn on the broken mechanics of a media industry and its degrading portrayal of an entire gender. An ode to itself by YouTube. If you are an average millennial you should recognize every single one of the references in this video. There are more wifi devices on earth that actual people. Learn about digital radio waves and the frequencies at which they vibrate with Nat & Friends. There, just saying these facts I already feel smarter. In her talk, Carol Dweck describes two ways to think about a problem that’s slightly too hard for you to solve. A great introduction to the Growth Mindset framework. Nat is back from another one of the best tech videos. She is good! How does a smartphone camera with the weight of a paper clip can take 12 megapixels photos? How does a sensor smaller than your finger nail record in 4K? Watch this video to find out. From an insider, all the ropes built-into our technology to make it evermore addictive. A handful of people working at a handful of tech companies steer the thoughts of billions of people every day. Peer behind the curtain. This video with its depth, has serious ramifications on how we use technology and for what purpose. A most inspiring talk. You should subscribe to Tekiota so you never miss another extraordinary tech video! 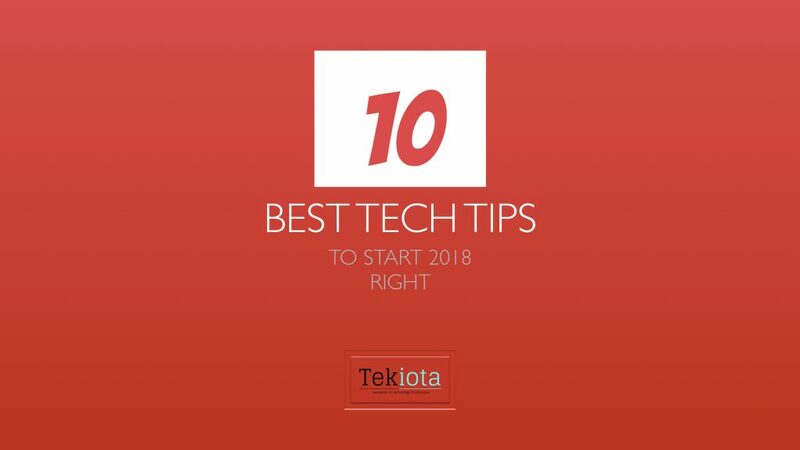 The post 10 Best Tech Tips for 2018 appeared first on Tekiota. I want you to start the year right with the best tech tips one could hope for in 2018. This tip unfortunately remains as relevant today as when I published this article. The main idea is to develop ourselves as knowledge constructors by critically curating a variety of resources. Are you ready to begin your journey into a new and virtual reality? Would you rather start with a pit stop in the augmented reality realm? These 7 apps are your starter kit. So many of you wrote to let me know how much you enjoy this toolkit. Make sure you know how to build your own random name picker and do other fabulous thing in two clicks with Google Sheets. 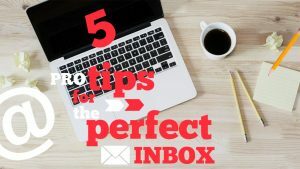 It’s time to crack the whip and master your inbox. Don’t drown in the flood of email. Start here and be on your way to regain your zen. Do you know how to copy part of your screen to a file on your laptop? Do you know how to copy your screen to your clipboard on your laptop? Not sure? Just head over and refresh your memory, it is only a two minute read. This was an absolute favorite this year. I received lots of positive feedback for these wallpapers which are ready to decorate your laptop screen. Be less ordinary. 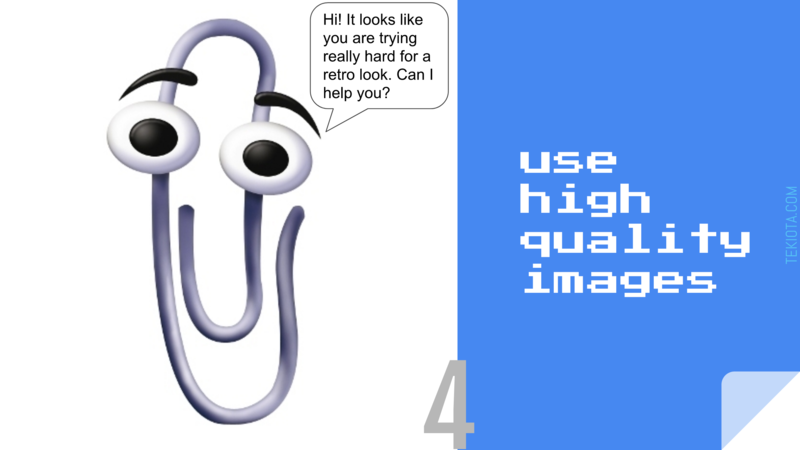 The simplest of our best tech tips? Perhaps. The most effective? Definitely. Bookmark this article and never fail to use the right online timer for an activity. 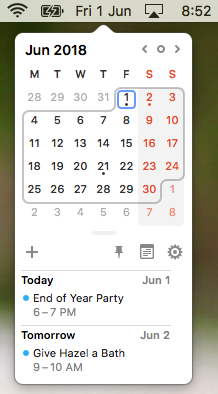 Hear hear, the new Google Calendar has come. It’s enough of a design refresh that you should explore our piece and discover the new features available to you. Don’t get frustrated by this update, learn the ins and outs of scheduling your next appointment. 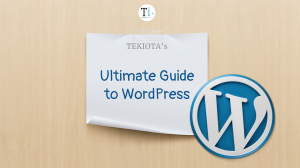 I wrote this guide out of necessity: WordPress is a big production now and you need steps to use it effectively. Cut though the overly complex interface, follow my lead and you will be able to design an amazing website with beautiful photos in no time. And of course, you should subscribe to Tekiota so you never miss another tech tip!